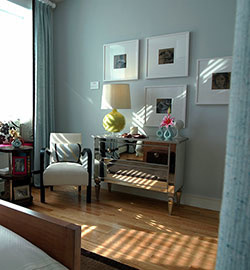 Grey - the color that connotes intellect - is one hue homeowners will be incorporating into their interiors next year. So says Debbie Zimmer, paint and color expert for the Paint Quality Institute, a leading source of information on interior color and design. In her annual color forecast for 2014, Zimmer is supporting grey in a big way: "It's the hot new neutral, a sleek and sophisticated color option that adds refinement to almost any room. "Walls that are painted grey are great backdrops for almost any style of décor, and grey is such a dignified color that it can elevate the appearance of even the most modest furnishings, " she says. But grey won't be the only neutral to be popular in 2014. According to Zimmer, those seeking a change from more saturated color will be happy to learn that white and off-white are back in vogue. Manufacturers of interior paint will offer extensive palettes of ever-so-subtle tints comprised of 30, 40, and even 50 'whites' containing just a hint of color. "As with grey, the ease of coordinating furnishings with a neutral hue like white is appealing to almost everyone," she says. "However, some will gravitate to white for more personal reasons having to do with a change of address: those who are downsizing will favor white or very light-colored walls to make their new, smaller interiors look more spacious; and for those who may soon put up a 'For Sale' sign, white is the wise paint color to apply before listing a home." "Another hot color in 2014 will be mustard yellow," says Zimmer. "Its influence is growing in both fashion and home furnishing fabrics. We also expect to see more use of the color on walls -- if not for entire rooms, then at least on accent walls." "In the end, color choice is a very personal decision, so whether you are thinking about doing some painting, or changing your décor, or both, stick with colors that you love. When it comes to your home, your opinion is the one that matters most."